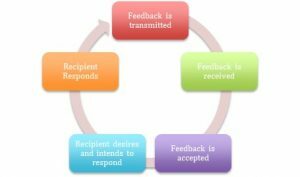 “Feedback: The supply of an input to some process or system as a function of its output” (feedback). First documented in the latter half of the 1910s, the noun, feedback, was derived from the verbal phrase feed back. Providing feedback in the form of performance reviews began in the 1950s when the U.S. Government passed the Performance Rating Act, incentivizing government employees with pay increases and recognition for a job well done (Whitlock). This chapter will take an in-depth look at feedback within the context of leadership. It will review feedback from a leadership quality perspective and discuss various available tools (360-degree feedback and performance appraisals) to assist with the provision of feedback. This chapter will also provide a detailed look at a few types of feedback as well as discuss the equally important response to aforementioned feedback. Methods for communicating feedback will be highlighted, as it is potentially as important as the feedback itself. We end the chapter with our response to the Five Guiding Questions for each of us. While there is no single “best” option for feedback, this chapter will help the reader understand the importance of and complexity to the provision of feedback, including some tools that may be used to improve its effectiveness. A question and answer session through the lens of the Five Guiding Questions with the authors will conclude the chapter on the quest to improving leadership and personal reflection on why they are so passionate about this topic. Let the journey begin! Akin to an immunization or handwashing, feedback delivery and/or reception has long lasting positive impacts. While immunizations may sting temporarily, the long-term effects keep us healthy and strengthen our immune systems, and in some cases, have eradicated disease. Hand washing, while not unpleasant, can feel tedious, but is an extra step in preventing spread of germs. Likewise, feedback may not always be a “feel-good” experience and if done often (as it should be! ), can start to feel unexciting (Riegel, 2017). However, multiple studies show that feedback, when delivered properly and at appropriate intervals, can ultimately reap multiple benefits that can include less burnout, less depression, improved immunity, increased job satisfaction, and greater mental and physical longevity (Nowack, 2014). As painful as it may be at the time, even negative feedback can incur positive benefits such as self-awareness and insight on what to work on next (Garnett, 2017). There is such a thing as a healthy feedback culture where leaders and team members are open to and provide continuous feedback to one another in a way that promotes engagement and maximizes performance. Organizational psychologist, Adam Grant, an expert on originality writes “feedback is where we get other people to hold up a mirror and say, ‘These are the ones that are promising. These are the ones that are dead on arrival…’” with respect to idea proposal. The same rings true in the world of healthcare leadership regarding tasks and performance (Grant, 2017). Feedback from and for leaders is integral in leadership growth and building a strong, productive team. When and how to provide feedback is the gray area that often leaves leaders scratching their heads or attempting to avoid the process altogether. Thankfully, leadership feedback is an area with a good amount of prior studies, thus providing tools to assist leaders in this critically important facet of leadership. Why focus on feedback and leadership? “Feedback is the Breakfast of Champions” is how one leadership expert puts it (Blanchard, 1982). Feedback on results is one of the biggest motivators for individuals; it keeps people going. (Blanchard, 1982). Talk about some powerful words! Motivators and drivers of motivation are key to performance. While some individuals will put their best foot forward because it is the right thing to do, many are seeking something in return. It may be a positive performance evaluation while looking for a raise or a simple ‘thank you’. Regarding the latter, it is important to realize that individuals work hard for ‘some reason’ and one reason may be the gratitude they receive from a job well done. According to a Gallup study looking at companies with the highest levels of engagement, recognition and praise are often used to increase commitment (Schwantes, 2016). This is also noted in healthcare organizations. In the journal article “Constructive Performance Appraisal Feedback for Healthcare Employees,” author Kent V Rondeau reports that “both healthcare leaders and their employees dislike performance evaluations.” Citing that these evaluations often are not considered as providing accurate or appropriate appraisal of one’s work and result in what can be deemed a “power struggle” rather than producing a conversation that results in improved outcomes (Rondeau, 1992). These benefits are seen secondary to the fact that “feedback” demonstrates that individuals are paying attention and noticing the effort put forth. Feedback demonstrates caring for another individual and appreciating their contributions. Ultimately, feedback (when given appropriately) results in individuals feeling more engaged, appreciated, fulfilled, and healthier overall (Riegel, 2016). Furthermore, a feedback-rich culture is a hallmark sign of a high performing organization (Wimer, 1998). Opposite the positive effects of well-given feedback, poorly given feedback can have equally negative effects on one’s mental and physical health. It [negative feedback] can feel like social rejection and result in real pain. This was demonstrated by a study conducted by C. Nathan DeWall from the University of Kentucky. It is important for feedback, especially feedback that can be perceived as ‘negative,’ to be task-focused or task-related behavior. This minimizes the potential for it be perceived like an attack. When task-focused feedback is provided, even if negative or demonstrating an opportunity for improvement, the result can still be a positive outcome and be beneficial to leaders, teams, and organizations. It is vital to create a healthy feedback culture; this benefits everyone. It is also important to note that the creation of this healthy feedback culture is the role of ALL team members, it does not rest solely on the leader’s shoulders (Riegel, 2016). It is important to note that the feedback must be accepted and the recipient must respond if the feedback is to be utilized and be considered effective. An important factor that will determine if the feedback is accepted is the source of the feedback and how well that source is trusted. It can be derived that as trust of a source decreases, the effectiveness of the feedback process decreases. It is also possible for a recipient to accept feedback, but for not change to be seen in performance. The desire to act is related to the perceived importance of the feedback and the anticipated results from a change due to a response (Earley, 1986). The balance of positive and negative comments can be essential to producing an effective response from providing feedback. Too much focus on only the positive and sometimes the negative can be overlooked or perceived as unnecessary. Too much focus on only the negative, and the individual may feel undervalued or underappreciated which may result in further lack of productivity desire for improvement. An article written by Zenger and Folman in the Harvard Business Review discussed previous research as well as their own on the “ideal ratio” of positive to negative feedback. While some questions have arisen about the validity of the previous data they mention in their article, the overall premise is that more positive feedback is the better course of action. In general, positive feedback is what motivates others to continue doing what they do well, potentially even better and with an increased passion, vigor, and desire. Even with the best of intentions, criticism can result in a lack of self-confidence and decrease self-initiative. Zenger and Folman state that the ideal time and place for negative feedback is when someone is “heading over the cliff” or when someone needs to “start doing something they are not doing right away.” Negative feedback can result in some change but does not spark initiative or motivate others to put in their best effort (Zenger, 2013). Regardless of the method chosen, the effectiveness will come down to appropriately identifying the necessary (and accurate) information to promote a superior performance and improve the feedback culture of the organization. Accuracy also depends on an evaluation of several potential environmental factors, organizational factors, and the executive’s role within an organization (Guinn, 1996). This data will likely result from one or more of the tools available to create and deliver feedback. A variety of tools are available to implement feedback, we discuss the 360-Degree tool next. 360-degree feedback is known by multiple names including multi-source feedback (MSF) or multi-rater feedback (MRF). Essentially, these terms are referring to a type of performance rating system gathered from the individual’s relevant network of coworkers. As one would expect, coworkers includes not only supervisors but also their peers, other team members, their subordinates, and sometimes even external stakeholders (Day 2000). Hence, the term 360-degree feedback. Feedback is anonymous. Ideally, this comprehensive method provides thorough assessment of the individual from multiple perspectives. Another advantage of this tool is the increase in self-awareness. Many studies have been completed on the usefulness of 360-degree feedback. There are also some studies that discuss where 360-degree feedback may not be useful and some challenges that pose a barrier to its use. What research supports its use? Beverly Alimo-Metcalf described the usefulness of the 360-degree feedback tool in leadership development in the late 90s (Alimo-Metcalf, 1998). At the time, the tool had only been available for use for a few years and the data available was limited yet promising. Alimo-Metcalf posed the question: Is the 360-degree feedback tool helpful for leadership development? She specifically looked into the role of the tool with respect to transformational leadership. Select conclusions, below, were based on the available research at the time and ultimately establish that managers lack self-awareness and are not in tune with their own strengths and opportunities for improvement. 1. Managers’ self-ratings are less highly related to the ratings of others make of them than peers’, bosses’, and staffs’ ratings are with one another. 2. Managers’ self-ratings are less accurate than others’ ratings when compared to ‘objective criterion measures’. 3. Staff are more satisfied with their manager and their job when their manager matched the managers’ self-perceptions. More ‘successful’ managers (as rated by their staff and boss) are less likely to inflate self-ratings of leadership. 4. Managers who have ‘inflated’ self-ratings: (i) overestimate their influence and (ii) are likely to misjudge and misdiagnose their own need for improvement. Leslie Atwater published “Multisource feedback: Lessons learned and implications for practice” in 2007 which included a review of the literature studying 360-degree feedback use and considerations for use up to that time. Importantly, Atwater noted that the context and culture in which 360-degree feedback is implemented is crucial. Other factors to consider before use of the tool include perception of the process, the actual process, and individual differences such as personality and goals. Factors to keep in mind regarding feedback are the characteristics of the feedback (positive, negative etc. ), organizational support to implement the feedback provided and, again, individual attitudes and behaviors regarding the feedback. Atwater and colleagues conducted a three-year study to investigate the reactions from feedback provided through the 360-degree feedback tool and how it influences behavior change (if at all) in two separate organizations. A notable finding from their work included feedback format. The authors found that feedback should be provided numerically with or without text commentary for better reception, as it is perceived more clearly. The authors hypothesized this is from an inundation of numerical values placed on other aspects of wellbeing such as blood pressure, IQ etc. With respect to how feedback is delivered, they concluded that “…reactions to negative feedback were not transitory mood states with minimal implications for leadership development, but rather influenced subsequent behavior. These findings reinforce the need for organizations to consider how they facilitate feedback distribution and how they encourage developmental activities following feedback.” (Atwater, 2007). 1. Have a clear purpose: Ensure people know why they are filling out surveys and what they are expected to do with their results. 2. Start at the top: It is critical that leaders enthusiastically participate in 360-degree feedback to promote a positive example for their followers and peers. 3. Have an open mind and be willing to change: Choose to be receptive to others’ perceptions and critiques as an opportunity to learn about self. 4. Conduct a pilot test: Consider a “test run” to weed out any bugs or other logistical issues. This will make for a smoother transition and may be perceived as less radical if all the kinks are worked out beforehand. 5. Communicate: Make sure that all involved individuals know who they are completing the survey for and what is going to be done with the data. 6. Safeguard confidentiality at all times: Protect the data and the rater’s identity. If confidentiality is breached (or perceived to be breached), the information gained is useless. 7. Evaluate and fine tune the system: As with any successful process, continuous quality improvement is a vital step. Feedback on the feedback tool is important in creating a feedback-rich culture. Ultimately, utilizing the 360-degree feedback tool exhibits that everyone’s feedback is important, shows that feedback is taken seriously and displays that the organization is taking steps to invest in their leaders’ and employees’ development. 1. Culture shock. If implemented in a culture that is not open to or used to feedback, use of the tool may not be beneficial without first a proper introduction and education. 2. Non-timely feedback. Once the feedback is obtained, the turn around time to deliver it to the individual should be short so that the information can be useful to them. 3. Gamers. Some individuals will try to “game” the process to help or hurt others which can dilute the data and ultimately destroy any confidence in the results, ruining the use of the tool for others. While barriers to implementing the 360-degree feedback tool do exist, organizations can take steps to overcome or lessen these barriers. Some solutions may include but are not limited to: ask for participation from everyone in rolling out the tool, get feedback on the feedback tool to ensure accuracy (does it “look right” or “seem fair”), train all users/ raters, ensure anonymity, automate the process by using electronic surveys in favor of paper, and implement safeguards to eliminate bias. The 360-degree feedback tool can be a great resource as long as it is used appropriately and expectations are managed accordingly. Performance appraisal is another term used to describe the feedback provided to employees about their job performance and influences promotion, pay increases, and candidacy for termination or increase in responsibility (Lam 2002). It is important to note the distinctions between performance appraisal and 360-feedback are that the appraisal is typically from one source (supervisor) and is not anonymous. Lam notes that feedback, when provided in a timely fashion and comprehended, can be beneficial to the ratee and the organization. Typically, research has shown that favorable performance feedback is assumed to develop more favorable work attitudes that persist for the ratee. What about the impacts of negative performance appraisal? Lam and colleagues, have described such effects in their work and detail the long-term effects on employees and their work affect. Performance appraisal has been an integral part of measuring employee day to day workings for decades. Research on performance appraisal has been conducted since the early 1980s (Levy 2004). Data has been collected on performance appraisal from several perspectives, including social and organizational contexts. More specific areas of research include performance appraisal paired with personality types, performance, and work attitudes just to name a few. These areas of research extend beyond the scope of this chapter. Similar to 360-degree feedback, performance appraisal implementation will vary based on the organization utilizing this tool. Performance appraisals are typically delivered at a minimum of once a year. Organizations with a healthy feedback culture may perform them more often. (Levy, 2004). Some argue that the performance appraisal is outdated and does little to acknowledge true performance and motivate behavioral change in those who warrant it (Murphy 2016). How and how often feedback via performance appraisals is delivered can make all the difference. See below for more on feedback delivery. What are the limitations of performance appraisals? Some experts describe the performance appraisal as an archaic tool that was useful for evaluating “replaceable cogs in the business wheel” (Murphy, 2016). Murphy went on to describe the role of performance appraisals as useful when “labor was viewed as a nuisance needed to achieve business outcomes. The original performance appraisal was a management tool intended to control workers ‘too stupid to understand what they were doing.’” While this view is quite extreme, this opinion is widely shared by many leaders and employees alike. One argument against performance appraisal is that it brushes over and hinders the growth of intrinsic characteristics vital to success such as purpose, autonomy, and mastery (Murphy, 2016). In order to inspire passion, these skills must be nurtured. Studies have revealed that up to 66% of employees indicated that not only are performance reviews unhelpful and irrelevant, but that they hinder their productivity (Meinert, 2015). The performance appraisal may be an outdated tool, but some may argue that any feedback is better than none, and it is a good starting point to cultivate a healthy feedback culture. 5. How well the appraisee trusts the motivations of the appraiser (Rondeau, 1992). 1. “Tell and Sell.” This consists of providing feedback to an employee while attempting to convince the individual that the feedback is both accurate and fair. This approach is more appropriate and satisfying for individuals who are considered under-performers, new to their role, or young and inexperienced. This was one of the most common practices at the time of publication, but not necessarily so today. 2. “Tell and Listen.” The key difference with this method is that it encourages feedback from employees, which in turn, helps reduce employee defensiveness to areas of potential improvement and provides the satisfaction of one’s thoughts and concerns being heard and taken into consideration. While considered not as common at the time of publication, this has grown significantly more popular over the decades since. 3. “Problem Solving.” This method is designed to promote employee growth and development through active listening and mutual discussion of ideas, interests, and goals for the future. The process also meets employees needs for recognition and self-worth while also meeting needs of employer providing feedback. This method has also grown in popularity over the decades since publication (Maier, 1958). The “sandwich technique,” which is declining in popularity, was very popular for several decades. The basis of this technique is to begin with a positive attribute, follow with an area of improvement, and then conclude with another positive. This method was thought to reduce likelihood of defensiveness and to ensure focus on the positives while also pointing out an area of improvement. Whatever method is chosen, it is important for the intended purpose of the performance review to be clear. It can be beneficial to allow the employee to speak to their own past performance then point out positives followed by areas of opportunity for improvement. Most importantly, specific goals with a follow-up plan should be set prior to the conclusion. Specifically, for healthcare institutions, this feedback process can be challenging. This is in large part due to the vast number of varying specialties and disciplines that are being evaluated. In this setting, it may be beneficial to have varying types of processes for varying individuals based upon several factors, including job scope, quality of performance, employee’s motivation, ability of employee to accept constructive criticism, employee’s experience and tenure, and lastly the appraiser’s ability to communicate feedback. The 360-degree feedback tool can be customized for healthcare administrators to include the domains most important to them (Garman, 2004). Performance appraisals in health care may also be tailored to fit the needs of the organization and leadership (Chandra, 2004). Regardless of how feedback is delivered, it should be organization-specific and meaningful. Several points have also been made on communication style. These include, say what you mean and mean what you say, utilize active listening, limit criticism, ensure feedback is clear and unambiguous (Rondeau, 1992). Another expert, Kenneth Nowack, explains how communication is key to “taking the sting out of feedback.” In his article, he talks about how, even though feedback is often required, it can have several side effects, including mental, physical, physiological, and emotional. While the research on this topic has not provided a clear-cut, best-choice method, he recommends choosing options that provide a clear message, involve both highlighting positives while also identifying opportunities for improvement and involving input from both parties. (Nowack, 2014). Lastly, some experts will argue relevance of performance evaluations in today’s society. Research suggest that ~95% of employees are not satisfied with how they are evaluated at work and ~90% do not feel the evaluation provides an accurate appraisal. Arguments are made in how today’s “employees” are much more highly trained than back in the 1900s “when employees were treated as replaceable cogs in the business wheel.” Today, employees expect autonomy, purpose, and mastery to be an expectation of their workplace environment. With this type of expectation, many annual appraisals can feel tedious and meaningless. When individuals are as highly skilled and trained as many professionals are today, there are other methods which may be more effective for promoting growth in the workplace. Some of these considerations are weekly or quarterly conversations with employees about progress, having more formal performance conversation quarterly for more constant feedback, connecting employees with a “shared purpose” to highlight the importance of their work, and keeping tabs on the overall morale of employees and levels of engagement (Murphy, 2016). 1. How do you define leadership? Why is it important? HPE: I define leadership as a quality or characteristic exhibited by someone in a position to guide others to perform to the best of their ability while providing the tools and motivation necessary for success. Someone exhibiting leadership is proactive in their efforts to improve their environment. Leadership is not going with the flow, but instead having the vision for what the flow should be and employing others to create and maintain it, as well as propel it forward to be completely optimized. It also means recognizing when the flow should be readjusted and calculating how to do so then collaborating with others to figure out how to go about it. To me, a successful leader inspires others to perform to their fullest potential ability. This is important in many fields but personally, I look for leadership opportunities in my area of healthcare. Leadership is essential for providing direction and demanding accountability. Without leadership, systems would likely not function efficiently and processes would be disorganized. CDW: I define leadership as the ability to influence others to work together towards a common goal. A “true” leader may or may not be in a position of power, but rather, their passion and charisma are more important than their actual “title” or “role.” Leadership is important to make progress and to allow change to occur to accomplish the greater good. Some lead from the front, some the back, and some the middle. Ultimately, leaders know how to motivate and encourage others to become leaders and to put their best effort into all they do. 2. How do you lead? What is your leadership style? HPE: I would consider myself to be a leader in my personal life in areas of fitness activities. In my powerlifting gym, I am often the one who gathers the workout from the trainer and relays it to my group. I keep my group organized by suggesting the lifting order and selecting the weight used. This is done in a team based way. Throughout the workout I help identify areas of improvement and provide positive feedback on things done well. I would identify my leadership style as transformational because I use encouragement and am the person others can look to for the instructions or feedback on their performance. I use a mix between coaching and supportive because I want the workout to progress but not at the expense of people feeling bad about themselves or unsupported. CDW: I prefer to follow the old adage of “lead by example.” I love to teach and demonstrate to help others grow. My style of leadership is one of high expectations, just as I would expect my “followers” to have high expectations of me. I do not shy away from confrontation, but when necessary, it is done with the utmost respect, and the response I typically receive is of similar respect. I have greatly improved my ability to delegate over the years, but I am also not opposed to stepping in when necessary. At the end of the day, I take full responsibility for the situations I control, and while I will “allow” others to learn from their own mistakes, I will not allow something to fail if I perceive it to be too great of a step in the wrong direction. 3. How do you co-lead and work with other people? HPE: Where I work, I am one of three other pharmacists, and I co-lead with them by maintaining consistency with our process of treating our patients and keeping the lines of communication open amongst the three of us. I like to be supportive of my co-workers and would identify more as a follower. I jump in to help whenever I see the opportunity to, and oftentimes, I try to help before something needs done to help decrease the workload of my coworkers. CDW: I work very well with others and do not mind sharing the leadership role as long as my counterpart(s) and I have a common ground. We do not need to agree on everything, as a difference of opinion can often lead to growth. However, a degree of common ground is required to ensure the shared leadership role is fruitful and leads to productivity and desired results. Depending on the scenario and my passion for the specific task at hand, I may tend to be more of a hands-on type of co-leader while other times I take a step back and provide support as a co-leader. 4. How do you follow? How do you manage your boss? HPE: I follow with high competence and high commitment most of the time. There are instances when I do not feel like I have the ability to complete a task, but I remain highly committed to figuring it out or asking for help. My boss has a supporting/transformational leadership style, so it feels like we are more teammates than subordinate/boss. CDW: As mentioned above, I have high expectations of my “leader.” As long as I can understand the position of the leader and buy-in to the goal, I provide unwavering support to help accomplish the desired goal. However, if I potentially disagree with the direction we are headed, I do not hesitate to speak my mind and help influence and change the direction we are headed. 5. How will you improve your leadership? HPE: I can improve my ability to lead and enhance my leadership qualities by understanding how leaders and leadership have evolved over the past years. Additionally, I can improve by recognizing that there is no perfect definition of a leader and acknowledge that there is a balance between art and science in what generates a great leader. I will be open to constructive criticism on how to improve and be deliberate in making strides toward incorporating the skills and examples of other successful leaders. I will improve my leadership by setting goals of how to be a better leader than I was the day before because there is no end point when a leader has “made it” or learned all that can be learned. CDW: I have years of experience with varying leadership roles and have taken several courses and certificate programs which focus on leadership. Every day I continue to grow through knowledge gains and new experiences. I have used this course to continue my growth and understanding of leadership and continue to mold my leadership style to one that remains effective and useful with the current culture. I strive for constructive criticism (realizing its importance) and seek it out to continue to improvement in all aspects of my life, whether professional or personal. 6. **BONUS QUESTION** Why is feedback and leadership important to you personally? What personal experiences prompted you to do more research on feedback and leadership? HPE: My pharmacy education, subsequent experiential rotations, and two years of residency provided numerous opportunities for feedback from preceptors and for self-assessment. It can be difficult to rate yourself on a scale of one to five when you are just learning how the real world works. The feedback I received during residency spanned from helpful to deleterious, depending on who and how the feedback was delivered. I often felt completely incompetent following a feedback session and questioned my ability to be a good pharmacist. Knowing that one day I would be responsible for evaluating a student or resident on their work, I was motivated to learn how to provide feedback constructively while preserving the ratee’s psychological well being. After conducting research on how to best deliver feedback and understanding some of the tools available to assist leaders in feedback delivery, I feel better equipped to rate others and be rated in return. It helps that I found some articles along the way that help raters not feel so incompetent after feedback was not provided in the most effective of ways. CDW: Similar to my co-author, I received A LOT of feedback during my pharmacy education, experiential rotations and two years of residency. Some of this feedback shaped me to become the pharmacist I am today. Some of it, however, was extremely toxic! Thankfully, being optimistic and having a strong support system helped me to overcome the toxic feedback and focus on the feedback that was truly helpful. These experiences helped me learn what works well for me and ways of providing feedback I should never employ as an evaluator myself. I have learned that self-evaluation is key as a working professional as a means of growth and development. I have also learned that many individuals provided false feedback,as they are “afraid” to provide truthful responses. When I truly need honest feedback on something, whether it be a professional presentation or when considering a job change, I look toward individuals who will give the straight truth without sugar-coating anything, and I appreciate their honesty. I have also been the evaluator of 100+ pharmacy students in my career and have approached every one of them with the approach I have found helpful over the years. I also request their honest feedback in return. The outcome? I approach my professional students with a high level of expectation while also demonstrating that I truly care about them and their career. Whether positive or negative, I am always 100% straightforward with them. Sometimes this is easy, other times not so easy. However, I have learned that when you are deeply honest with others (positive or negative) while also maintaining a high level of respect, the outcome is impressive. I have had many students reach out in the future to thank me for how “hard” I was on them once upon a time and thank me for truly caring. My methods have been reinforced with the constant return of positive responses to my approach. I take great joy in helping to shape these individuals lives and hope they will continue to do the same for others in the future. That being said, I am constantly looking for opportunities for further growth and development. I take great joy in helping shape lives, but I also know how important of a role I have and do not take it lightly. I likely spend “too much” time providing evaluations, but I do not regret the outcomes it produces. Just like the thanks I receive, I have individuals in my life to thank for being brutally honest and helping me to become the person I am today. By now, it is evident that quality and frequent feedback is part of the foundational matrix critical to becoming an effective leader in the healthcare world. There are multiple ways to go about gathering, delivering, and scheduling feedback to and from others. In a perfect world, feedback would be gathered from both leaders and employees on a continual basis. The delivery of feedback would be presented in a way that makes sense, depending on the context of the organization and the relationship between the rater and the ratee. Based on the culmination of the information presented in this chapter, feedback in leadership is an area that is dynamic with more to be learned to optimize this activity that is frequently dreaded by all parties involved. It is also important to realize how the “right way” to provide feedback continues to change as society changes. Hopefully this chapter gives some insight on where feedback started and the strides that have been made to improve it, as well as dispenses pearls of wisdom to incorporate into daily life. While criticism is sometimes necessary, do NOT forget to provide the absolutely necessary positive feedback that motivates others to keep going and to do more; to be more creative, more passionate, more dedicated to the overarching goal. Positive reinforcement and demonstration of appreciation are the keys to a motivated future (at least for now). Lastly, the two of us have each other to thank for continued support over the years; from pharmacy school, to residency, to our current occupations, graduate school, and personal lives…we are always there for one another and continue to provide the much-needed support and feedback for one another. This chapter would not be possible without the trust, respect, and openness we have for each other. Leadership in Healthcare and Public Health by Paige Erdeljac and Chris Westrick is licensed under a Creative Commons Attribution 4.0 International License, except where otherwise noted.